Habit: Perennial herb; resin canals obvious. Stem: creeping, often rooted at nodes, 20--50 cm, branched or not, glabrous or glandular. Leaf: opposite; blade 1.5--2.5 cm, ovate to +- round; petiole present. Inflorescence: flowers 1 in leaf axils; pedicels >= subtending leaves. Flower: calyx lobes 5, 5--8 mm; corolla yellow, lobes 5, 10--15 mm, ovate, tips sparsely to densely glandular; stamens 5. Fruit: rarely produced, 5--6-valved, < calyx, +- ovoid. Chromosomes: 2n=30--43. 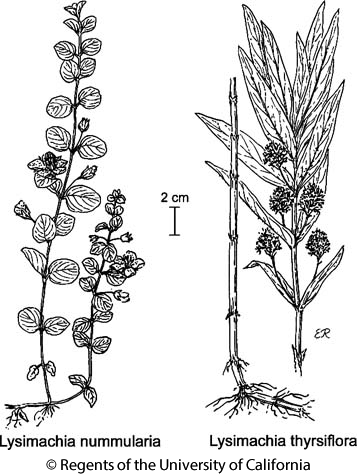 Citation for this treatment: Anita F. Cholewa 2014, Lysimachia nummularia, in Jepson Flora Project (eds.) Jepson eFlora, Revision 2, http://ucjeps.berkeley.edu/eflora/eflora_display.php?tid=32378, accessed on April 19, 2019. No expert verified images found for Lysimachia nummularia. n SN (Folsom, Sacramento Co.; near Quincy, Plumas Co.); Markers link to CCH specimen records. Yellow markers indicate records that may provide evidence for eFlora range revision or may have georeferencing or identification issues. Purple markers indicate specimens collected from a garden, greenhouse, or other non-wild location.